A new video captured and shared by MacCallister Higgins, the co-founder of self-driving startup Voyage, gives a closer look at what seems to be one of Apple’s “Project Titan” self-driving cars (via The Verge). 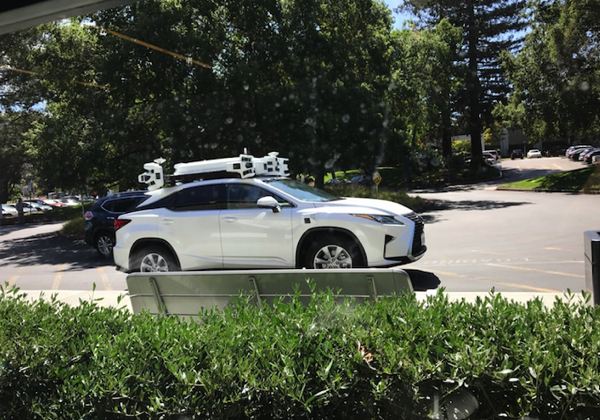 Encased in Apple-esque white plastic, tons of sensors, including six Velodyne-made LIDAR sensors, several radar units, and a number of cameras, have been fitted on the car. Higgins referred to the vehicle as “The Thing” due to the bulkiness of its sensor array. When asked if he caught a look at the compute stack, he said that it was likely located on the roof with the sensors, which would indicate a departure from other self-driving car operators, who typically load their GPUs in the vehicles trunks. Tim Cook has previously confirmed in an interview that Apple is currently “focusing on autonomous systems” rather than a car stamped with the Apple logo, which could be used for many different purposes.